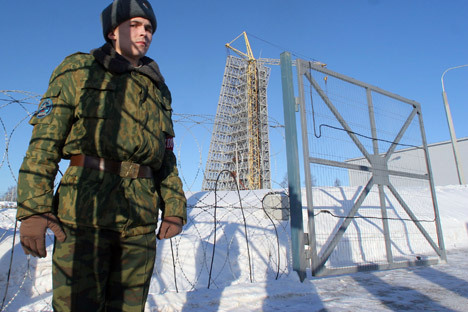 Russia has wound down operation of the Gabala radar station, which forms part of its ballistic missile early warning system (BMEWS). The Foreign Ministry of Azerbaijan was notified of the decision on Dec. 9. The agreement, framed in 1992 for a 20-year period, has been consigned to the history books. The Daryal radar system, built in the Gabala region of Azerbaijan, was commissioned in 1985. With a radius of approximately 3,728 miles in all directions on Earth and in space, this missile approach warning system covers almost the entire Middle East, including Syria, Israel, Turkey, Iran, Iraq, the Persian Gulf, Afghanistan, parts of India, and all adjacent seas. In 1991, after the collapse of the Soviet Union, it became the property of its host country. Because Azerbaijan was (and still is) unable to operate it as intended, it agreed to lease the station to the Russian military for $7 million per year, plus utility costs. The Soviet Union had more than 10 early warning radars like the one at Gabala. After 1991, that number was reduced to four. The others lay outside the Russian Federation. Whereas Alexander Lukashenko granted ownership of the station in Belarus to Russia, the rest became the property of the formerly Soviet, newly sovereign states. As a result, Latvia’s two radar stations were blown up by local authorities, while the two in Ukraine were handed over to the national space agency, which steadfastly refused to allow Moscow to keep its military vigil. Kazakhstan, however, did permit Russia to lease its station at Balkhash. Over time it became apparent that, in the interests of security, new stations had to be built inside Russia itself. The first highly prefabricated BMEWS (ballistic missile early warning system) radar stations — the Voronezh-M (meter range, VHF) and the Voronezh-DM (decimeter range, UHF) — appeared in the 2000s at Lekhtusi near St. Petersburg, followed by installations at Armavir, Pionersk near Kaliningrad, and Usolye-Siberskoe near Irkutsk. There are also plans to replace the other aging radar stations. How is it that Moscow and Baku, who are obviously on good terms with each other, failed to reach an agreement to extend the lease of the Gabala radar station? Sources at the Russian Ministry of Defense assert that it was due to "Azerbaijan's unconstructive approach to framing the terms and conditions of the new lease." Russia's generals are "bewildered by the demand to hike the annual rent by an order of magnitude and offer only a short-term lease." In other words, Baku is now seeking $300 million for the lease (before, the deal was for $7 million) and only offering the base for a 3-year period (instead of 20 years). The projected cost of renting the station on those terms is comparable to building two brand-new stations in Russia. Azerbaijan, for its part, never put an actual figure on the rent, maintains the country’s Foreign Ministry's press office head, Elman Abdullayev. He says Azerbaijan has always stressed that the money should compensate the environmental damage caused by the radar emissions and lost tourist revenue. It is interesting that these are the same arguments cited by the Latvian authorities in closing down the radar station at Skrunda: After the demolition job, an American radar station aimed at Russia sprung up, and the environmental concerns somehow dissipated. The Russian Defense Ministry responded by saying that the price was not the only issue. Even if it suited Moscow, the terms of the new agreement would have to be 15-20 years, in order to justify such an investment and upgrade the installation according to the growing need to control airspace in the direction of the Middle East and the Indian Ocean. Baku, however, proposes to enter into a contract for just three years, with negotiations to extend it to follow. Moreover, all Russian hardware and equipment imported into Azerbaijan to modernize the Daryal station would be considered Azerbaijani property (the station is ours so why not the equipment too, they say). For Russia's military, this is certainly one headache they could do without. The Gabala radar station is an important, though not critical, part of the country's early warning system. Moscow has a new facility that is similar in operational scope to Daryal already in place at Armavir, Krasnodar Territory: the highly prefabricated Voronezh-DM. It also covers an airspace radius of 3,728 miles, including the Middle East and a large section of the Indian Ocean; and it is a lot cheaper to operate. In that case, why was Russia's Defense Ministry so interested in Daryal in the first place? The reason is that the military wanted to combine Daryal and Voronezh-DM into one system to double capacity. In addition, during routine maintenance in Armavir, the Gabala station would continue to monitor the coverage area, and vice versa. That now seems to be off the table. Essentially, this is no big deal, since Voronezh-DM is highly upgradable. Professionals argue that Daryal is easily replaceable. Furthermore, replacing the station would be more economically feasible than renting from Baku: not half the price, but a third or a fourth. Experts also reject the hypothesis that, having stonewalled Moscow, Baku wants to offer the Gabala station to Washington for the monitoring of Iranian missile tests. "Without Russian know-how and software, which only we have and will be destroyed as soon as the last Russian officer leaves Gabala, Daryal will be just a hunk of metal. Expensive, but militarily useless," an expert said. This was also the case in Ukraine, where Kiev haggled long and hard over the leases to the Mukachevo and Sevastopol radar stations before offering them to NATO. Nothing came of it, and both Kiev and Brussels were left empty-handed. Azerbaijan's politicians clearly had their own agenda in deciding to reject Moscow's proposal. Whatever the outcome, a decommissioned Gabala will not pay them any dividends.